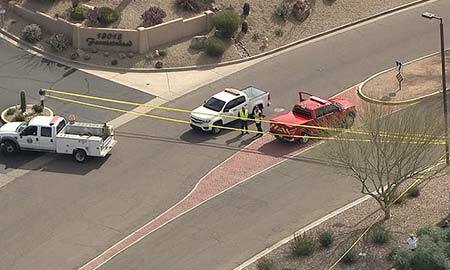 Fountain Hills, Arizona—An accident in Fountain Hills this morning left two people dead and two severely injured. A tan-colored SUV struck four pedestrians near Saguaro and Palisades Boulevards. According to Rural Metro Fire Department, two people were pronounced dead at the scene. The other two were transported to a local hospital. Maricopa County Sheriff’s Office deputies are investigating the accident. No additional information presently is available regarding the cause of the accident or the conditions of the two people taken to the hospital. We extend our condolences to the victims’ families and friends and wish speedy recoveries for those who were injured. Tragically, a third person has died from injuries sustained as a result of this accident. The fourth victim remains in critical condition.